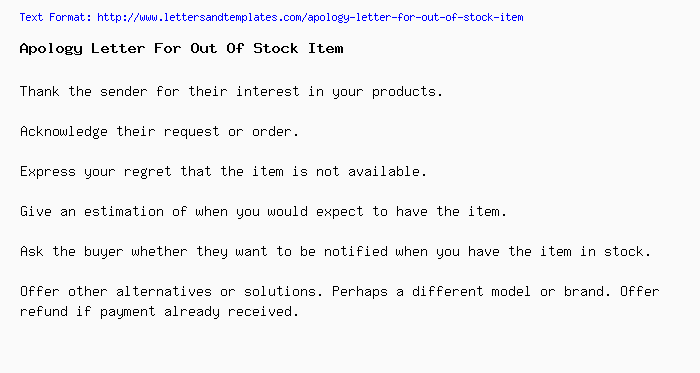 How to write a letter to apologize for an out of stock item? Thank the sender for their interest in your products. Acknowledge their request or order. Express your regret that the item is not available. Give an estimation of when you would expect to have the item. Ask the buyer whether they want to be notified when you have the item in stock. Offer other alternatives or solutions. Perhaps a different model or brand. Offer refund if payment already received. We received your recent order for [product name]. I regret to inform you that this item is currently out of stock. We expect to receive a shipment by the end of the month and we would be more than happy to reserve a quantity for you. If that seems like a long time to wait, then I suggest that you try the [alternative item]. Please tell me what course of actions suits you best.